Srila Bhakti Sundar Govinda Dev-Goswami Maharaj describes the defining characteristics of Srila Raghunath Das Goswami’s line. With this in mind, Raghunath Das went to Vrindavan. When he met Rupa and Sanatan, he got new life. Seeing their devotional practice and Mahaprabhu’s preaching programme fully established in Vrindavan, Raghunath decided not to leave his body. He felt very deep separation and stopped taking prasadam. He began to take only a cup of buttermilk once a day. By the grace of Mahaprabhu and the will of Rupa and Sanatan, Raghunath lived eighty or eighty-two years in this mundane world. He composed many prayers to Radha-Krishna and descriptions of Their Pastimes: the Vraja-vilasa-stavaka and others. Sometimes, we find that his verses give us more life than Rupa Goswami’s. He wrote many verses, but we are very enlightened by a few of them. The line of Raghunath Das Goswami is the proper line for us. We heard this from Srila Guru Maharaj, Srila Bhakti Raksak Sridhar Dev-Goswami Maharaj. If we want Rupa Goswami’s grace, then we must follow the line of Srila Raghunath Das Goswami. In that way, we must reach Srila Rupa Goswami’s lotus feet, and when we get Rupa Goswami’s mercy, then Radha-Krishna’s service is very easy to get. Raghunath Das Goswami’s mood was very high. 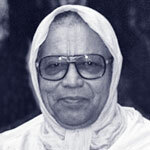 His life’s goal was exclusive service to Radharani, but under the guidance of Rupa Goswami. In another verse, Srila Das Goswami showed us how the relationship between Guru and disciple is maintained in the highest stage. That is our fortune, and we have got that from our Guru Maharaj. The expression in this verse is very high. When we receive Srila Guru Maharaj’s mercy, it will appear in our heart and show its divine form in our service life.